Dan and his wife live in New Zealand. 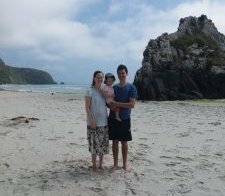 In New Zealand homebirth is not common, but nor is it frowned upon. It is generally supported by medical staff and government agencies. The hospitals are staffed and run by experienced midwives with doctors intervening when called upon. They planned a homebirth, went through 95% of the labor at home, but transferred to the hospital after significant difficulties birthing their baby. 1. Why did you choose homebirth? We choose homebirth after becoming disillusioned with the doctors and hospital process. The original plan was to have our baby in hospital. However, after being subjected to weekly ultrasounds from 23 weeks till 38 weeks, we didn’t want to go back! The doctors thought our baby was too small and even wanted to induce labor at 32 weeks, but we did not agree with the diagnosis or consent to an induction. We had the support of our midwife in this, without whom we would not have done this. Our baby was born perfectly healthy at 41 weeks weighing 7.1 pounds. 2. Whose idea was it, yours or hers? If hers, what convinced you to agree? If yours, what gave you the idea? We knew our midwife was very pro-home birth and so the thought was put in our mind. As we became sick of the hospital after all the scans, the idea of a home birth grew more and more attractive. It really seemed to be a decision we came to together at the same time! 3. What homebirth books or resources did you find to be the most helpful? My wife and I went to a anti-natal class where we were able to meet and learn with 7 or 8 other first baby couples. This was something we really looked forward to each week and was a good preparation. After the birth we discovered The Birth Hour, a podcast of birth stories. The accounts are told by women and are very moving and often entertaining. 4. Before the birth, what fears or issues did you have surrounding homebirth (or birth in general)? How did those change for you after experiencing the birth? I don’t remember any particular fears that I had before the labor and birth of our first child. I was blissfully unaware! Haha. I did not worry about something going wrong outside of the hospital. We only live a 5 minute drive away, so in the case of an emergency we were pretty safe. 5. What do you wish someone had told you before your first homebirth? What advice would you give to a first time homebirth dad? Eat well and sleep well, as much as you can, leading up to the birth. We went into our first birth already tired and then we forgot to eat through the labor process. As the labor dragged on we became more and more exhausted and it made it all so much harder. So make sure you’re getting to bed early and getting plenty of protein! 6. Which part of the birth did you find to be the most difficult or challenging for you? Watching my wife suffer was the hardest part. We laugh now because I was the one throwing up at various points due to exhaustion and stress! The other challenge was how long it took. The time it took from labor starting, until the baby was born, felt like it would never end. I really struggled through each moment, and I wasn’t the one in physical pain! 7. Did you have support during the birth from your guy friends? If so, what was the most supportive? If not, what would have helped you the most? We certainly had plenty of friends and family thinking of us and praying for us. My mom is a midwife and she was very supportive of us having a homebirth. My guy friends couldn’t care less if we had a homebirth or a hospital birth, so long as a healthy baby is born! 8. How was your interaction with the midwife during the birth? What could have made that better? Our midwife was excellent. She was recommended to us as ‘the best midwife’ by my mom. She was very supportive and experienced and I can’t fault her for anything. Our baby was born around 7PM on Christmas day after a long labor. I felt a bit sorry for our midwife missing the whole of Christmas Day with her family. She didn’t begrudge us that fact at all (although we have heard since that she no longer takes on women due at that time! Haha. That’s why we’ve got a different midwife for our second baby which is due next week). 9. How has the relationship with your partner changed after having a homebirth together? We did not achieve a homebirth with our first birth. We transferred to hospital when we could not get the baby out after 3 hours of pushing. After we got to the hospital we were supported by fresh midwives (in New Zealand the maternity wards are run by the midwives and doctors intervene if necessary). After another 2 hours of pushing the baby was delivered without any medical interventions. No suction, no pain medication, no excessive monitoring, and no doctors, so we were very thankful for that. I found new respect for my wife after this display of her strength and courage to get the baby out! 10. Would you have another homebirth? Why or why not? As mentioned, our second child is due next week. We are all set and ready for a homebirth – and it’s going to happen this time! We feel safer laboring and giving birth at home. My wife knows that were she in hospital she would be more likely to get an epidural, and then more likely to have complications and a c-section. She prefers the quicker and easier recovery of a natural birth! Dan and his wife Naomi are the parents of two children, one girl (2) and one unknown (in the womb). As a side hustle they write about heat press machines on their website howtoheatpress.com. Their desire is not only to birth at home together, but to work from home and educate at home together as well.